The Flappy Bird Phenomenon is Real: What’s Your High Score? The indie developer of Flappy Bird has created a smash viral hit that you may have heard about by now. Dong says Flappy Birds is getting 2-3 million downloads per day on iOS and Android, with no paid promotion, solely rising on organic growth, currently at the number one spot in the App Store in 96 countries around the world (including Canada) according to App Annie. 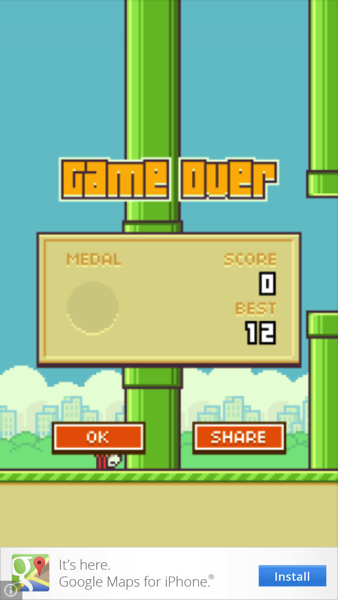 We were hesitant to download Flappy Birds but succumbed to the game during a Super Bowl party. After experiencing it first hand, the game seriously has some entertainment value. Let’s just say it was fun watching Denver Broncos fans find themselves immersed into a Flappy Birds competition since the game on the field was such a dud for them. From the developer’s standpoint, the ad banner supporting the game is getting non-stop impressions which surely is helping him make bank. Some have doubted the success of Flappy Birds since it’s pretty unbelievable for one solo dev to have three games in the Top 10 of the App Store at the same time (Super Ball Juggling is #4 in Canada, while Shuriken Block is #9). What do you think? Have you started playing Flappy Birds? What’s your high score? Click here to download the game, it’s free.